Tentative plans are underway for a parish summer fun-raiser to be held on Sunday, August 25, 2019. That is the Sunday closest to the anniversary of the first dedication of Holy Redeemer Church back in 1916. The Woman’s Club and Knights of Columbus are onboard. We plan to have music, food and a raffle as part of the event. 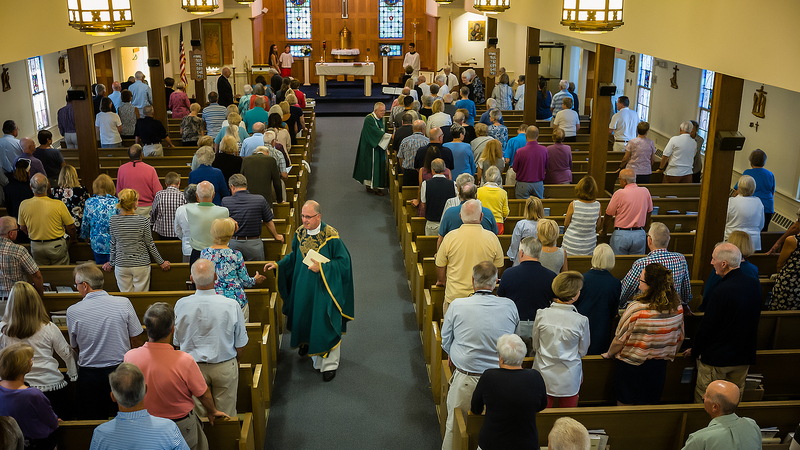 It is meant to be an opportunity for parishioners to get together for fellowship and fun as the last days of the summer wind down. We will need quite a bit of help so come to the next planning meeting on Sunday, February 17, 2019, at 4PM in the parish center. Caty Street would like to thank everyone who contributed towards the cost of her March mission trip to Peru. Cathy, one of our parish youth, is a nursing student at the University of Maine, Orono. At school Caty is participating in a wonderful campus ministry organization called, the Fellowship of Catholic University Students (FOCUS). On her spring break she will be participating in a medical mission trip to Peru sponsored by FOCUS. Two weeks ago, Caty asked for sponsors to help her raise $2,600 to pay for the trip. We’re happy to report that thanks to your generosity Caty has raised the $2,600 and got a little more. The excess will go towards paying for her flight from Boston to Miami where she will connect with other members of her group. Any excess that Caty might raise will help another student who would like to go on the trip but doesn’t come from so generous a parish. If you would still like to join Caty’s mission support team, simply go online and donate by credit card or bank transfer at http://www.focusonline.org/goto/Catherine_Street or mail a check made payable to Catherine Street to 368 Long Pond Drive Harwich, MA 02645. Donations made online by credit card or bank transfer are tax-deductible, charitable gifts. Again, thank you for being so generous to Caty. There is more generosity to report. As a pre-Christmas fundraiser the Holy Redeemer Conference of the St. Vincent de Paul Society conducted their annual Giving Tree. Donations totaling $14,265, were made by 145 donors. That was an approximately 25% increase over last year. You can drop a cash donation to the work of the SVDP at any time in the Poor Box located at the back of the church on the left as you enter. Thank you for your assistance. Finally, back in November we commitment to sending the $2,086, raised from donations for entering names in the November Book of the Dead to Catholic Charities USA for hurricane disaster relief. That was also a gesture of generosity on the part of parishioners. When winter storms like last weekend’s hit our collections take a hit too. If you aren’t able to get to Mass on a weekend because of inclement weather please “make-up” your donation the next weekend. Parish expenses never take a week off. As a reminder you can sign-up for online giving and never miss contributing to the parish because of bad weather or because you are away from home. You can sign-up for automatic giving at our parish website www.holyredeemerchathan.org. On the Homepage just go to “giving’ in the middle the second line of headers.at the top of the page. Click on it and a drop-down list will appear. Click on “Donate On-line” and just follow the commands. It only takes a few minutes. If you have any problems just give us a call at the Parish Office (508)945-0677 and someone will be glad to assist you. You can change your level of giving at any time. The 34th World Youth Day will come to its climax this weekend, January 22-27 in Panama City. Youth representing 155 countries are expected to join Pope Francis for the celebration. Please pray that attendees will be strengthened in their faith through their participation and grew in their desire to be faithful disciples. The Diocese of Fall River Vocation Office is hosting a discernment weekend for Men ages 18-45 at the Betania II Spiritual Life and Marian Center, 154 Summer St. Medway, MA from Friday February 22 to Sunday February 24. If interested, please contact Fr. Jack Schrader at frschrader@fallrivervocations.org or 508-695-6161. The Diocese of Fall River Office of Faith Formation is offering a retreat for men at the Sacred Hearts Retreat Center 226 Great Neck Road, Wareham the weekend of February 8-10, 2019. The theme of the retreat is living strategies for a full live. Retreat leaders are Ernie Collamati & Deacon Bruce Bonneau. Space is limited to 25 reteatants and the cost is $165. To register call Deacon Bonneau at 508-678-2828 Ext. 13 or email: bbonneau@dfrcs.org. Reserve Saturday, March 9, 2019, so you can attend the 2019 Fall River Women and Men’s Conference to be held at Stonehill College, N. Easton. The theme of this year’s conference is Living in the Light of Hope. Conference presenters will include Bishop Robert Reed from the CatholicTV Network, Scripture scholar and author Dr. Mary Healy from Detroit’s Sacred Heart Seminary and Deacon Pedro Guevara-Mann, author and host from Salt+Light Media of Canada. The day will conclude with Mass celebrated by Bishop Edgar da Cunha. A dozen parishioners attended last year’s conference. Some of them got their picture taken with Bishop da Cunha and ended up on the cover of his pastoral letter. The parish is planning to hire transportation again this year so you need not worry about driving. More information will be coming later in the month. Help Wanted: Anyone a Graphic Artist? Our parish has many talented people so there must be someone in our parish with talents as a Graphic Artist or with some advertising experience. The parish could use your gifts to put together a parish brochure and advertising campaign for the summer months. Please call the parish office at 508-945-0677 or email us at parish@holyredeemerchatham.org to offer your gifts. Fr. George Bellenoit, who covers daily Mass for Fr. Sullivan’s day off on Wednesdays, will be a “snowbird” for the months of February and March. In his absence Deacon Joe Mador will be conducting Communion Services on Wednesday.